You’ve probably seen the article about the abandoned Walmart being transformed into a public library the size of two and a half football fields (wow!). They took an unused space and turned it into something beautiful and highly useable: it is a mentality that I think the green movement should pursue more intentionally. But it is also a mentality that libraries should look more into, especially since funding is down and demand (for certain services) rising. The article on PSFK only said that this was ‘affordable’ to construct, but I imagine it would be very affordable. The structure already existed and was not exactly prime-real estate but tons of square footage… Just look how open and welcome the library is! 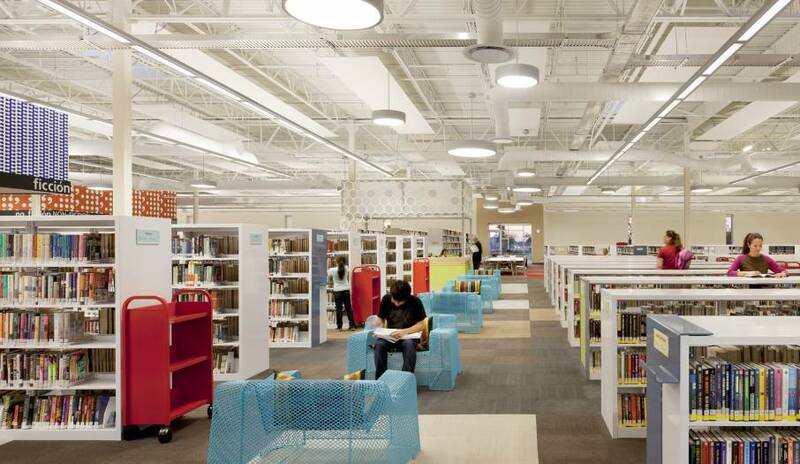 The focus of this blog post is to look at several libraries that have upcycled, altered or redefined spaces and material for affordable, functional, and beautiful designs. 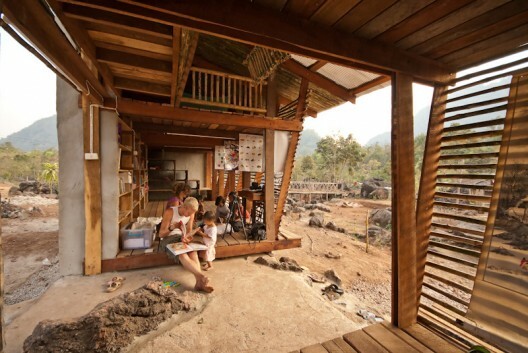 First up a library and health clinic in Indonesian constructed from shipping containers. This library was designed by an Indonesian architecture firm who choose shipping containers as the construction material because of easy and affordable availability and easy and affordable construction. Next, two libraries that shed the rather Victorian notion that libraries ought to be separate from nature and the world. These two libraries forget the walls. Here is a small library in a vineyard. The library consists of several rows of shelves mimicking the flow of the vines. While the practicality might easily be questioned, there are several wonderful things about this. One, the architecture is stunning just by directly incorporating the local environment; two, it challenges the notion that libraries must draw patrons inside, why not instead go to them outside; and three there’s wine! 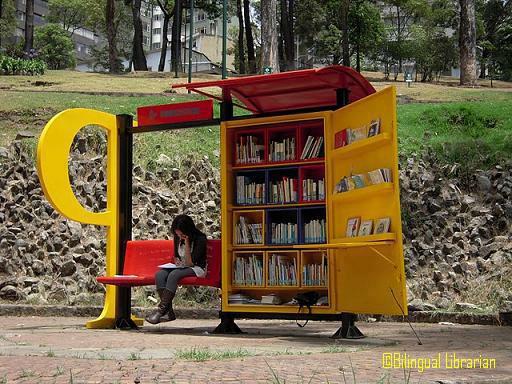 And this miniature library in Colombia,which combines bright colors that contrasts nicely with the green surrounding it. 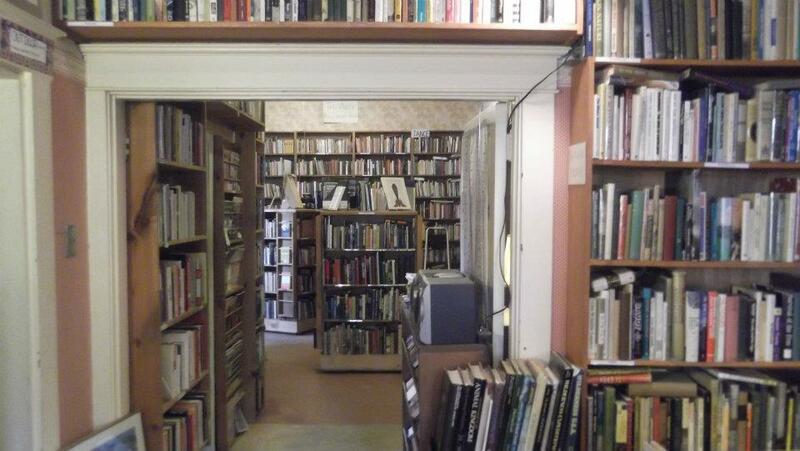 Like the vineyard library, it does away with walls but this one was designed with usability in mind. I imagine this library cut the majority of its start up and operating costs: the structure is simple and sustainable; the library itself run by volunteers. The New Jalisco Library designed by Lot-ek, a sleek sci-fi looking library made from old plane bits. 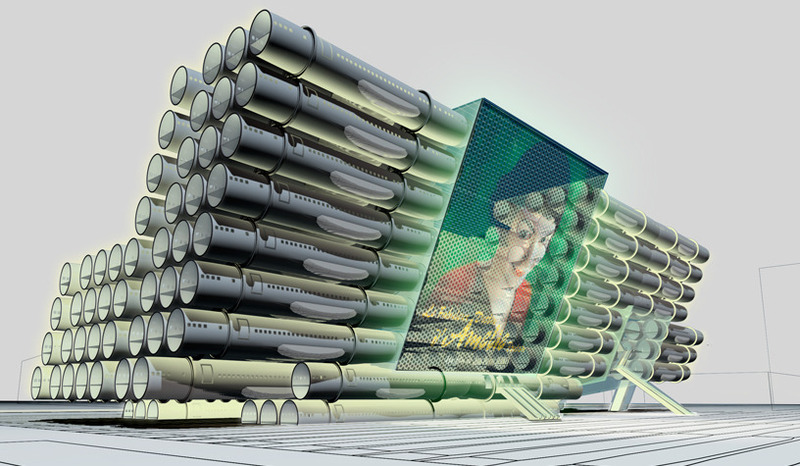 This library design uses more than 200 Boeing 727 and 737 fuselages. The cost it takes to restore the aluminum of the fuselages to a reusable state outweighs the benefit so these usually wind up in a desert graveyard of metal. This library reclaims the material and everyone wins! The construction cost of the library is reduce and previously un-recyclable material is reinvented and made relevant again. 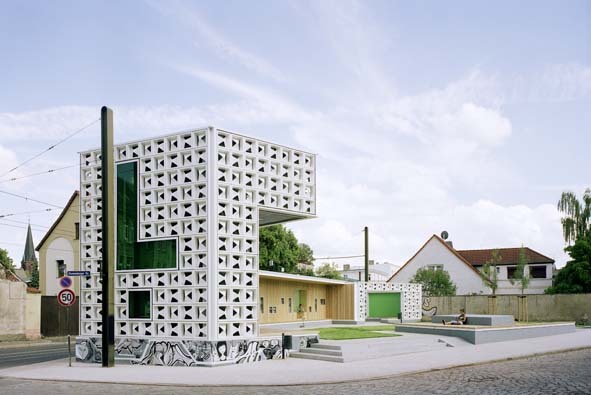 This library was constructed by the community for the community in direct collaboration with a architecture firm. The library is built on fallow ground and in a city with a vacancy rate of 80%, therefore on property otherwise unusable. The library incorporates the facade of an abandoned warehouse near the site, re-using and preserving history. 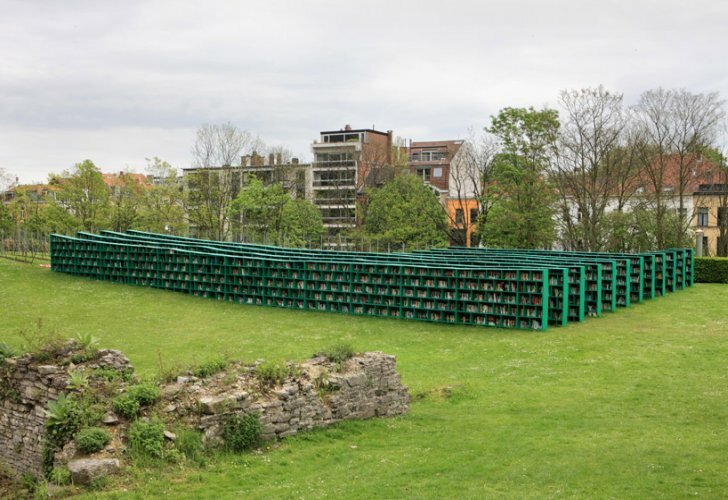 The library was originally built from beer-crates (collected by community members) until money for the actual construction could be raised. Green space is an important component and increases functions of the library. In the picture, you can see an outdoor stage. This library was constructed in two weeks, using completely local material and local labor. It is the library for the Safe Haven Orphanage designed for children. Inside is books, lots of open space, and places to read and interact. This library dissolves the divide between inside and outside, incorporating the environment into the design and using it for temperature regulation. The first two categories reinvent existing material for affordable construction; the last cuts down on the creation of new material for more sustainable and in the long run affordable production. I like the idea of combined use of space such as seen with the health clinic and library in Indonesia and the vineyard library. But most libraries already have many functions: community center, job-finder, coffee shop. What ideas do you have? What can we reinvent, reuse, and redefine? Thanks for reading! The Safe Haven Library is quite beautiful. It looks like a place you could settle down, relax and read! What can we reinvent, reuse, and redefine? Today I just put up a blog post about a bench made entirely of used transit passes. It’s on display as art and not actively being used to sit on, but I thought it was a clever way to reuse something that would have otherwise been thrown away. This entry was posted on July 10, 2012 by Laura in Uncategorized and tagged architecture, buildings, cool stuff, design, green, innovate, libraries, library, reading, recycle, reflections, reuse, sustainablity, thoughts.